I was running errands on the Upper West Side. 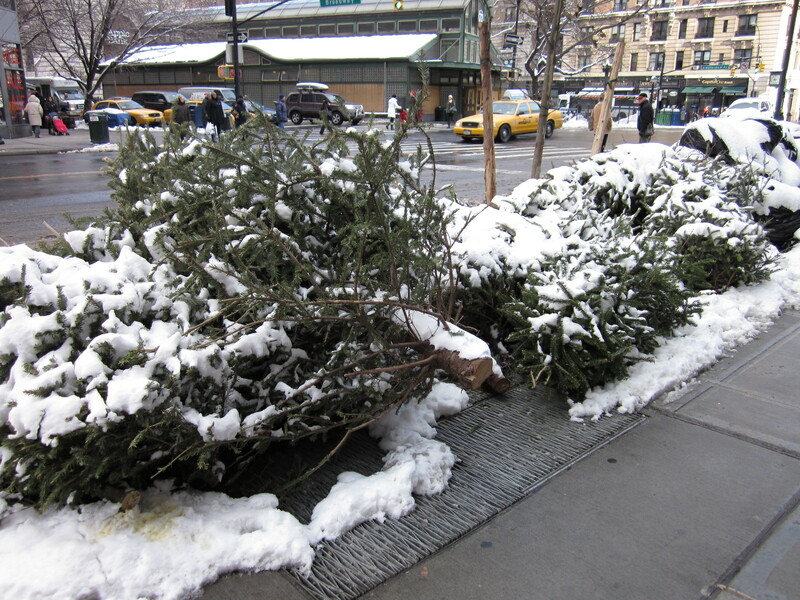 Everywhere I looked I encountered piles of discarded Christmas trees heaped on the sidewalk waiting for the trash collector, another post-holiday Gotham City tradition that is not as exalted as when those same trees were standing tall and fresh or when they were clad in traditional tree-drag. Trees with rigor mortis still clad in tinsel. Tree suffering double indignity piled under snow and carpet. That afternoon, they were simply reduced to piles of tree corpses that were of no further use to their owners. 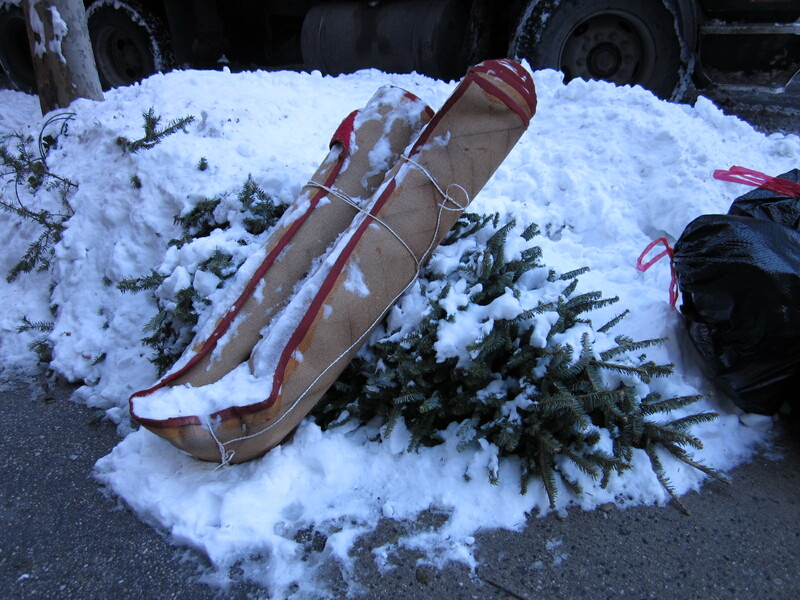 Most New York City apartments are tight on space, so the average resident is not going to be inclined to compost his or her tree. 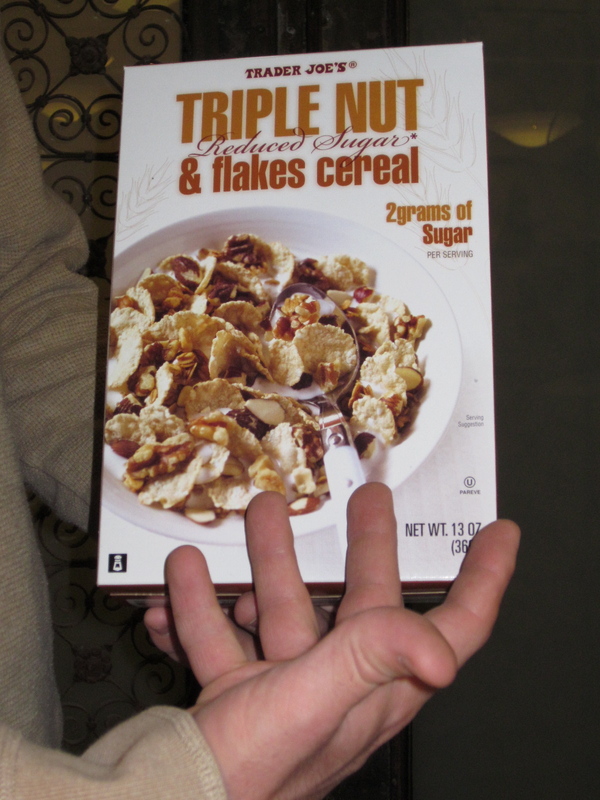 Last week, I tried a new Trader Joe’s cereal containing a key ingredient that could have been mulch. I gave it to my sidekick, Greg. At the risk of encountering the wrath of The New Yorker and a beating from the angry ghosts of Harold Ross, William Shawn, and their current fire-breathing legal department, pictured below is one of their more profound cartoons by Jack Ziegler that perfectly captures the post-holiday spirit. 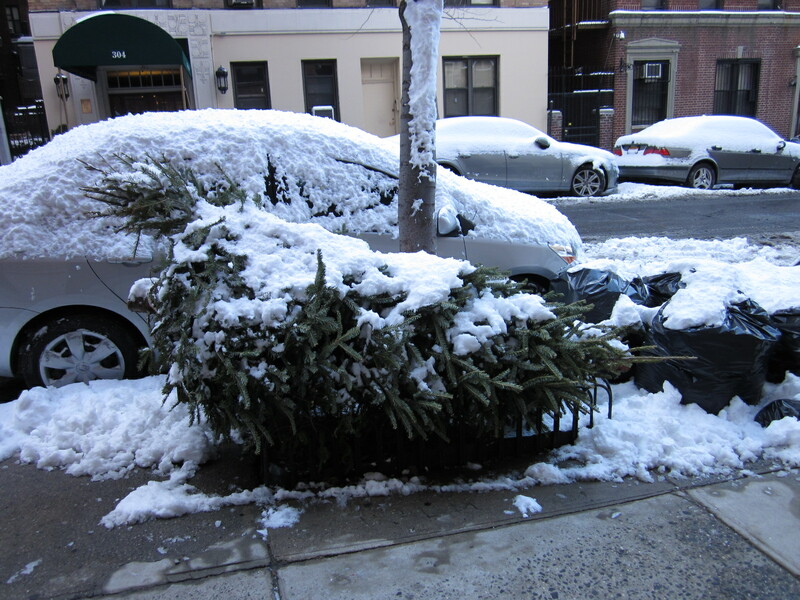 Another New York City tradition, dumping trees in any available trash can. This cartoon is also available as a holiday card on their The New Yorker Store web site. Some years back I had a next-door neighbor that kept her over-sized holiday wreath hanging outside her door for six months. By February, it was shedding needles so profusely I had to sweep my apartment’s entryway every time I entered. By April I was practically vacuuming hourly. Possibly, every time she entered her apartment, she was blind to the shower of needles forever falling. Maybe this wreath had some sentimental, or more likely, mental symbolism. I recall that she worked for Lord & Taylor, or Ann Taylor, or maybe she was a tailor. She did not strike me as a tree hugger-type. Several times, I considered politely asking her to “please take that eye-sore the hell down,” but it was her wreath, her door, and it was not as if she was hanging a giant holiday fruitcake that had attracted every fly on earth. Finally, one day in June while I was home indulging my favorite hobby, procrastinating, I heard a thunk outside our respective sanctum sanctorums. We simultaneously opened our doors to find her wreath collapsed in a heap on the floor. Me (thinking to myself): Oh happy day! Me: Old age or suicide. Neighbor: Do you think I should take it down? Me: Or piece it back together. I have a mini pine forest in my vacuum cleaner that I can pass onto you. Christmas is barely six months away! She got the message and threw it out. 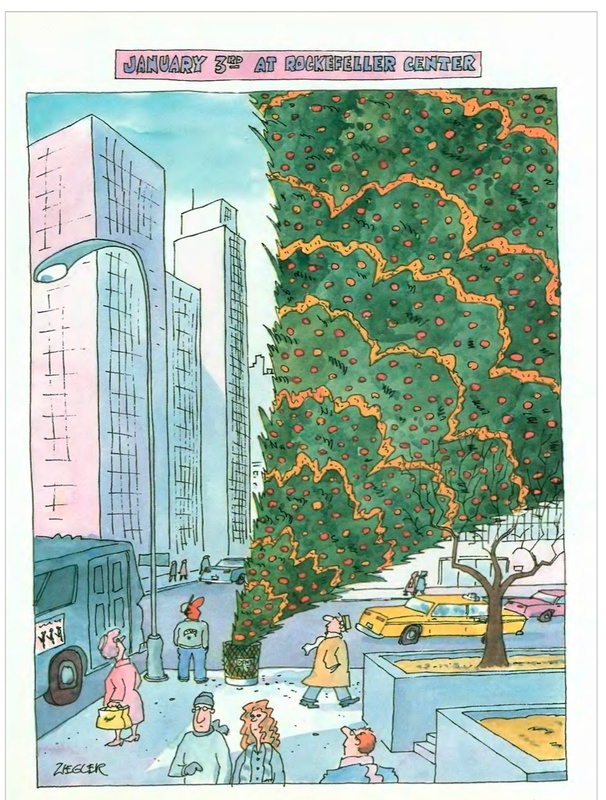 This entry was posted in Humor and tagged christmas trees, jack ziegler, new york city, the new yorker, Upper West Side. Bookmark the permalink.